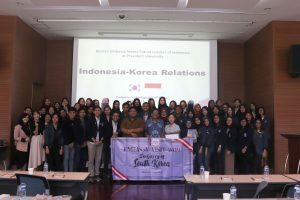 IRPRESUNIV.ORG, CIKARANG – On the 25th of March 2019, the Foreign Affairs division of President University Major Association of International Relations (PUMA IR) recently conducted an event, allowing the students of International Relations of President University to have the chance to visit the Embassy of South Korea in Jakarta. The visit was participated by approximately 43 students of batches 2017 and 2018, accompanied by Mr. Hendra Manurung, and Mr. Anggara Raharyo as one of the lecturers. The participants had gathered at President University Student Housing on the Monday morning, before arriving at the Embassy of South Korea located in Setiabudi, South of Jakarta City at 9.00 AM. There were several speakers that presented during the visit. The first was from His Excellency Ambassador Chang Beom Kim, the current ambassador of the Embassy of South Korea. HE Kim had expressed his gratitude for the participation and involvement, expressing that he was grateful to help with the future leaders, before it transitioned to Miss Ji Young Park, who had shown her presentation explaining of the relationship between Indonesia and South Korea. There were many interesting points that were given through the presentation, giving the participants deeper insight to how the bilateral cooperation between the two states have been for the past decades. It proceeded to a question and answer session after the presentation, where questions from the students of President University’s International Relations Study Program were answered by Miss Ji Young Park herself, and also Mr. Hendra Manurung expressing much gratitude for the activeness of the students in showcasing the knowledge and curiosity for the bilateral relationship. After the question and answer session, it proceeded to a sharing session from two women that work in the embassy, Mrs. Cut Mefiani Theresia and Mrs. Joan, who were both involved in the Embassy of South Korea. They had explained their experience in working with the embassy, the likes and dislikes of working in an embassy, and informed the participants that the embassy does hold scholarships for Indonesian students to study in South Korea. The event had closed off with Mr. Hendra Manurung and Andi Amirah Ajani, as Project Manager, giving the tokens of appreciation to Miss Ji Young Park, before the photo session, and a bit of free time for the participants, which marked the end of the visit.